Three years ago today, I started the Inspiralized blog! Well, technically, three years + one day ago I started Inspiralized, because the night before was the day I registered the domain (I was too excited!). So if we’re being technical…. Can you believe it? For those of you who have been following me since the beginning, I hope you’ve enjoyed the journey as much as I have! There have definitely been ups and downs, but the ups have certainly outweighed the downs – and for that, I’m grateful! This little blog has grown into a full blown business, but it’s even more than that – it’s helped me find my healthiest self and embrace body positivity. It’s helped me find out who I truly am, the kind of woman I want to be, and how I want to impact the world. Everyday I feel blessed to be able to bring my healthy recipes to all of you, and I’ll never take that for granted. Always on my blogiversary, I think about those two days (June 25, 2013 – I quit my job and June 26, 2013 – I started my blog.) I feel like it was just yesterday, truly! If you don’t know my story, you can read it here, but I figured I’d touch upon it briefly. On June 25, 2013, I wasn’t expecting to quit my job. I had been trying to build up the guts to do it for weeks, but I just couldn’t. It was a comfortable job with a good salary and a five minute commute from my apartment. How can you beat that?! Basically, that day, I went into my boss’s office and told him that I wanted to pursue this Inspiralized dream. Originally, I suggested I work part-time for his company and part-time on Inspiralized. He basically laughed in my face, told me that “you can’t make money on cookbooks” and tried to convince me that I’d be making a foolish, life-ruining mistake. He was a real jerk and I left his office, blood pumping, heart pounding. I was on the brink of tears. Honestly, there was no better feeling that night. I felt like a weight had been lifted off my shoulders and I was reborn or something. It was so empowering, exciting, scary, and uplifting. I felt like I could burst! That next morning, I walked with Lu to the PATH (he takes the PATH everyday into Manhattan where his office is) and on the way, there’s a Starbucks and I stopped in there, with my laptop and…. a dream. I opened my laptop and I can’t even put those feelings into words. I bought a coffee, logged into their WiFi, and literally made a bullet list of what I needed to do that day. I started my building my social media channels and of course, my first blog post. And as for today’s recipe, I think it speaks for itself. It was inspired by a Rachael Ray and Skinnytaste recipe, but modified to suit my cooking and ingredient preferences, as well as #inspiralized! 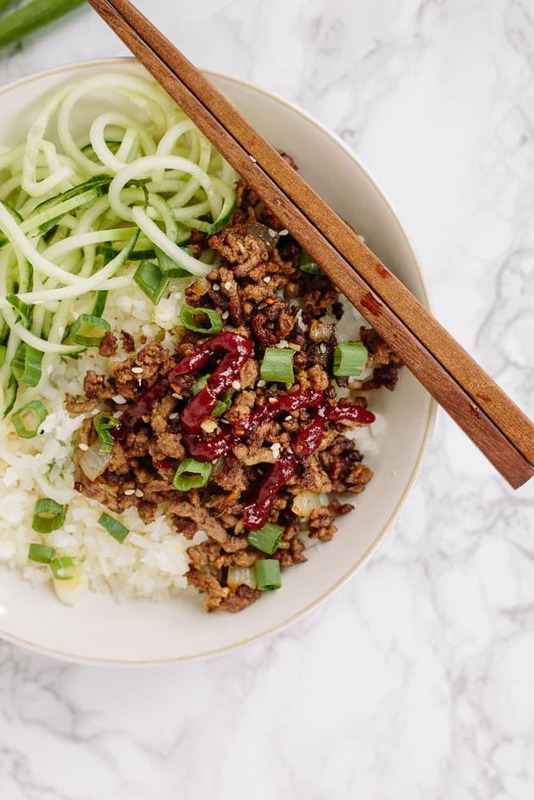 The meat is all kinds of savory and salty, and the cucumbers compliment the spiciness of the gochujang paste, a trending Korean condiment. Speaking of gochujang, this is the paste I used. Overall, a slam dunk meal for Korean food lovers and meat lovers. If you’re vegetarian, you can use crumbled tofu or seitan! That’s it – and as you know, I’m currently celebrating my blogiversary in Thailand – right now, we’re in southern Thailand! Make sure to follow along on Instagram. Heat a large nonstick skillet over high heat. Once skillet is hot, spray with cooking spray and add the ground meat. Breaking the meat up with a wooden spoon, cook the meat until cooked through and browned, 5-7 minutes. Add in the garlic, onion, and ginger and season with salt and pepper, cooking for 1 minute or until fragrant. Add the soy sauce, sesame oil and red pepper flakes to the skillet and stir well to combine. Cover the skillet and lower the heat to a simmer. Cook for 10 minutes to let the flavors develop. Meanwhile, prepare the rice. Place the daikon noodles into a food processor and pulse until rice-like. Place a medium skillet over medium-high heat and add in the coconut oil. Once oil melts, add in the white parts of the scallions. Cook for 5 minutes or until scallions soften. Add in the daikon rice and season with salt and pepper. Cook for another 3 minutes or so just to heat the rice through and soften to your preference. Divide the rice into bowls. Top with the beef and place a dollop of the gochujang sauce (about 1/2 tablespoon/bowl). Garnish the beef with sesame seeds. Top with cucumber noodles and serve. Karen! Thank you so much for sharing this story with us. We are so happy that you are going out and pursuing your dreams. You are a true inspiration. Thank you for being part of our community! Thank you so much, Danielle - your kind words mean a lot! Thank you so much, Allison! I love your comments, always! Ali, Thanks so much for sharing this story! 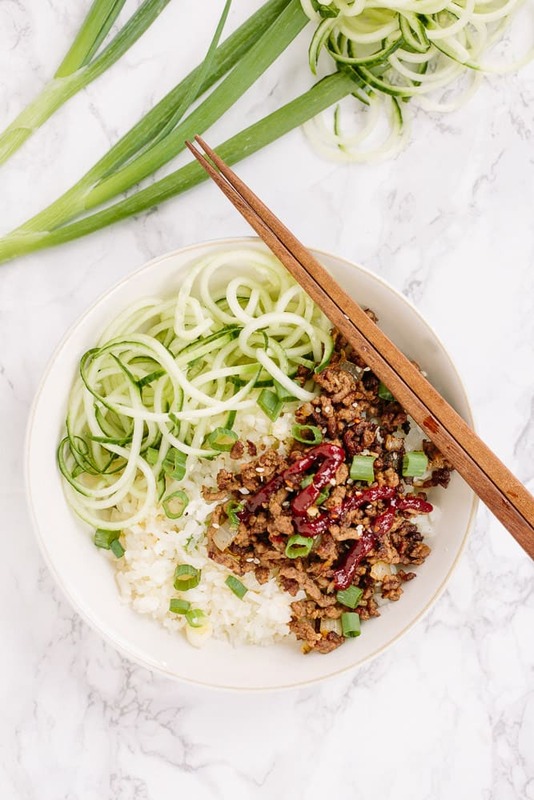 I started following Inspiralized a few months ago when I got my spiralizer for Christmas and started on my health journey. It's so inspiring to hear about someone just following their gut and taking action on their dreams - and I'm so appreciate of how your dream helped me! 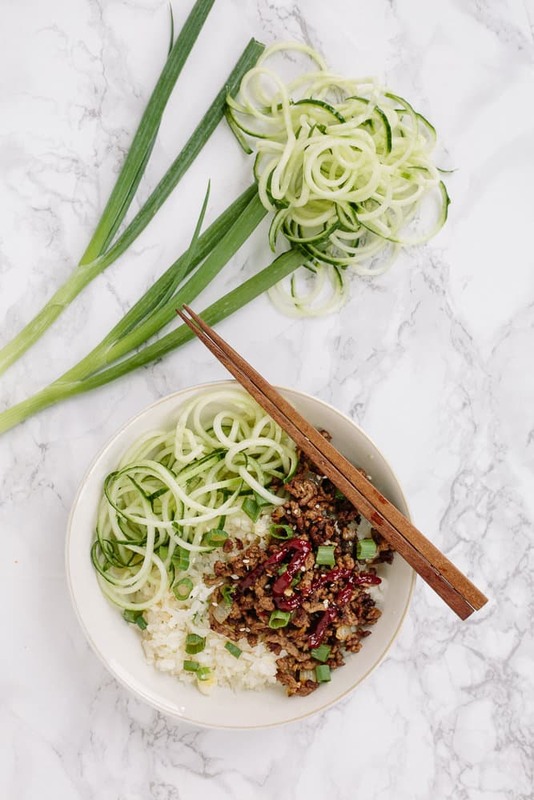 I lost over 30 lbs since Christmas, and my spiralizer has been a godsend in the process, not only of getting back to my thinner body, but changing my entire attitude toward food and health. Your recipes are fantastic and I'll be making this one tonight. Thanks and enjoy your anniversary! Thailand is just wonderful. Wow Ashley - good for you - I too want to lose the extra pounds that I have accumulated through poor eating habits and work stress. Congrats!! Thank you so so much for sharing this with us, Ashley! We're so happy to have you in this community and we're so proud of how far you've come. Keep it up! And stay in touch. Thanks all! Just gonna follow up that I did make this on Monday and it was so delicious! Made for great leftovers too! Thank you for sharing your story - and you are on the right track, it's a total, wholesome mindset! And congrats on the weight loss, I'm sure you feel great! Keep up the healthy lifestyle! You're so sweet! Thank you so much for your note, Ally! Hearty, substantial bowl that satisfies without leaving you feeling stuffed. This is the first time I've made spiralized rice and it turned out well. I only had 1 daikon on hand so I subbed a cauliflower for the second one in the recipe. I would like to try this with butternut squash rice in the fall/winter. Would make a colorful dish. So happy you tried it - and yes, it's so versatile, so try different varieties! Ban the boredom! I know that it takes so much bravery to let something go because you're afraid of what's going to happen next. But you have to LOVE what you do, otherwise you're going to be missing out on so much joy in life! I believe that what you did inevitably freed you and enabled you to cultivate something so amazing! Ali, I have been following you since the beginning. Your story is so inspirational....you are a "go getter" and true entrepreneur. You have always shown such wisdom and maturity. I am 70 years old, old enough to be your Grammy!! I have had my Inspiralizer for almost two years now and love making your recipes and trying my own. 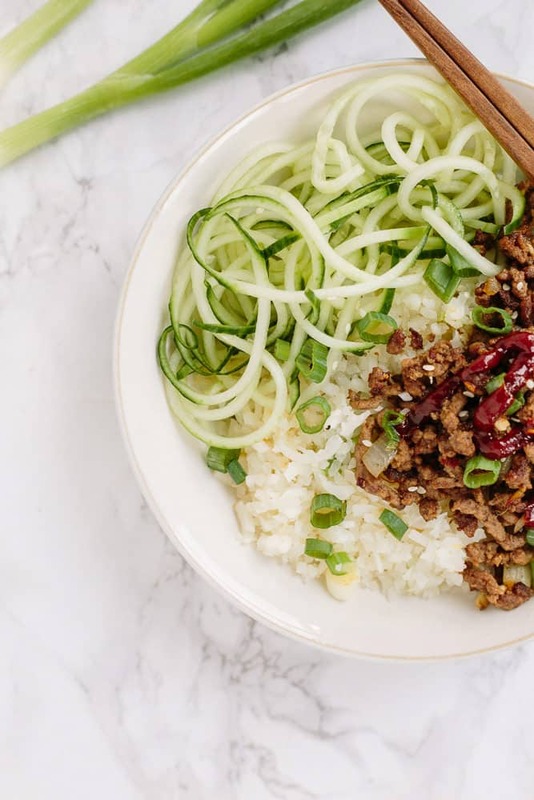 I want to make this Korean Beef bowl but not sure what gochujang sauce is, I have never used it.....Help? I am sure I will be able to find in in a specialty store. Congrats on your first anniversary....and blessings to you and you and Lu, you are adorable together, a match made in heaven!!! Ali - this was amazing!! Added some kimchi and it was perfect combo of sweet/heat. Tried this dish last night good, however as my son and i were talking, we thought why not make this dish, and in the end mix the beef and the daikon together, then place that mix in Green Peppers, then bake for 20 to 30 minutes.